While I’ve found most remakes of old Hollywood movies unnecessary at best (and for the most part dismal), I actually have enjoyed most of the recent Hollywood remakes of newer foreign films that I’ve seen- I found both Let Me In and The Girl With the Dragon Tattoo just as good as the originals, and while Quarantine was not as good as [rec], I did still enjoy it more than most remakes. When it comes to Asian films, tho, something often seems lost in translation. When they try to Americanize them, they lose a lot of their impact. I found The Ring to be hilariously ridiculous, and most of the others I’ve seen (Pulse, The Eye, Dark Water, etc.) are generally just dull. For some reason The Grudge was the only one that translated fairly well, possibly because they actually attempted to keep the minimilistic story and hightened sense of dread less Hollywood-ized. 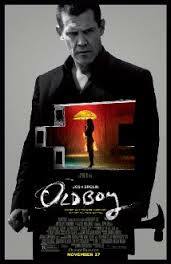 Now with Oldboy, they actually got a big name talent to bring it to U.S. audiences. Spike Lee is known for his style and flair, and the original Korean film is also known for it’s style and flair. So it would seem to be a match made in heaven, but once again something seems lost in translation. 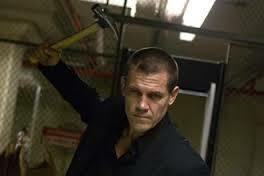 The story is fairly similar to the original- a general waste of flesh (Josh Brolin) is kidnapped and imprisoned with no reason given for his imprisonment. During this time he is framed for the murder of his ex-wife, falls into the depths of depresssion, then slowly pulls himself out of it and back together, ditching his alcoholism and working out, learning to fight and making himself into a new man while planning his escape. He is inexplicably released after 20 years, and has to figure out why he was imprisoned as well as find his daughter (who believes he killed her Mother) with the help of a childhood buddy and a young therapist/ nurse (played by the Olsen twins younger sister, Elizabeth). The first thing that needs to be gotten out of the way is this- the plot is preposterous, and relies on years of meticulous plans and lucky coincidences all flawlessly coming together without a hitch. If you cannot accept that and go with it, this movie will bug the hell out of you. The original was also like this, but executed more realistically and it seemed easier to go with it than in this one (in which the main reason everything works is evidently because the antagonist is incredibly rich, with Bond villain type connections. This doesn’t explain how a lot of the coincidences come together so perfectly, or how he seemed to be able to forsee so much of what will transpire). I think the kinetic style and atmosphere of the original helped mask and distract from the ridiculousness of the plot (as well as not having as many of the most ridiculous plot threads of the remake), and the feel of Spike Lee’s ‘just going through the motions’ direction helped bring it out. If you can accept this, and just go with it, this is an entertaining but ultimately styleless and lacking remake of a far superior movie. The actors do fairly well (a couple of bits of overacting notwithstanding) despite the bland direction, but the movie seemed more like a bunch of scenes cut together, with some of the connective tissue missing (it was originally over 3 hours long, and got cut down to 100 minutes). It takes away from the emotional value (and therefore makes the twist ending, which you can see coming pretty far ahead of time, have less of an impact). So while I did enjoy it somewhat while I was watching it, I couldn’t help comparing just about every scene to the original, and thinking how the original did it better. 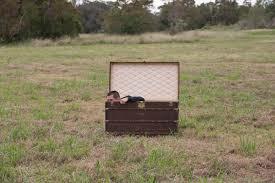 Then after it was over, the crushing ridiculousness of it all began to weigh on my mind. Perhaps I would have liked the full 3 hour version better, but the main word I keep coming up with in conjunction with this movie is ‘lacking’; in emotion, realism, and conviction. At least we’ll always have the original.